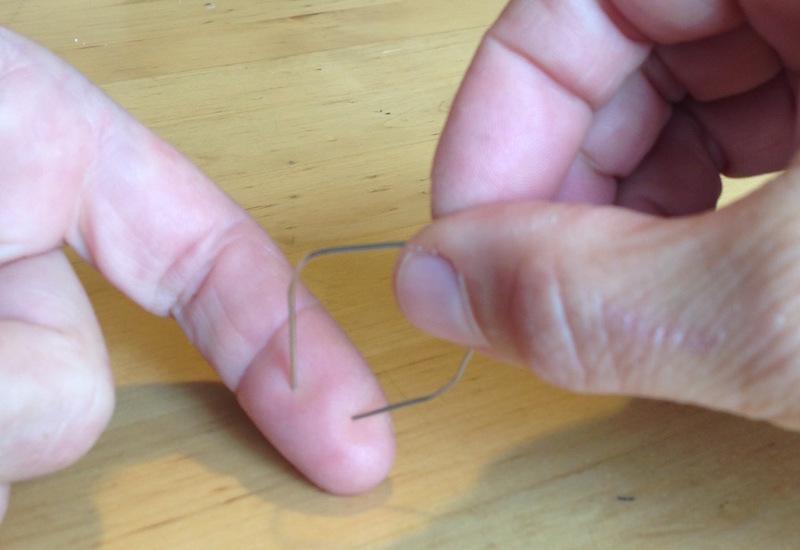 Detect how many points of a bent paperclip are touching you on different regions of your body, to predict touch receptor density. Explain to students that when you touch something, a touch receptor in your skin is activated, which makes a neuron fire to send a message to the sensory part of your brain. Some parts of your skin have a greater density of touch receptors and some have the touch receptors spaced further apart. By using the points of a bent paperclip to touch the skin, we can map the density of touch receptors on different areas of our skin. Demonstrate to students how to run the touch test and use the worksheet. They will practice on the forearm first. One student should lay their forearm on the table and turn their head away, so that they cannot see themselves being touched. The other student of the pair gently touches the forearm with either one or two points of the paperclip, making sure that two points contact the arm at the same time. The student being touched tells their partner how many points they thought touched them (but does not look or find out if they were right yet). The student doing the touching then records whether the answer was correct or not and tests again in a slightly different spot (but without telling their partner if they got it right yet). This first run with the forearm can be used as practice and students can follow the order of one- or two-point touches indicated on the worksheet. Once they have completed the forearm row of touches for one student, they can look at how “well” they did (though they are not good or bad in their success, but are mapping their body for touch). Students switch roles to record the forearm results for the second student on a second worksheet. Then they can move on to testing different parts of the body. For following tests, students should randomize the order that they touch with one or two points (so that the order cannot be learned). For each body part, they should still touch with one point five times and two points five times. If students have more time, they can add their own body parts to test and record. 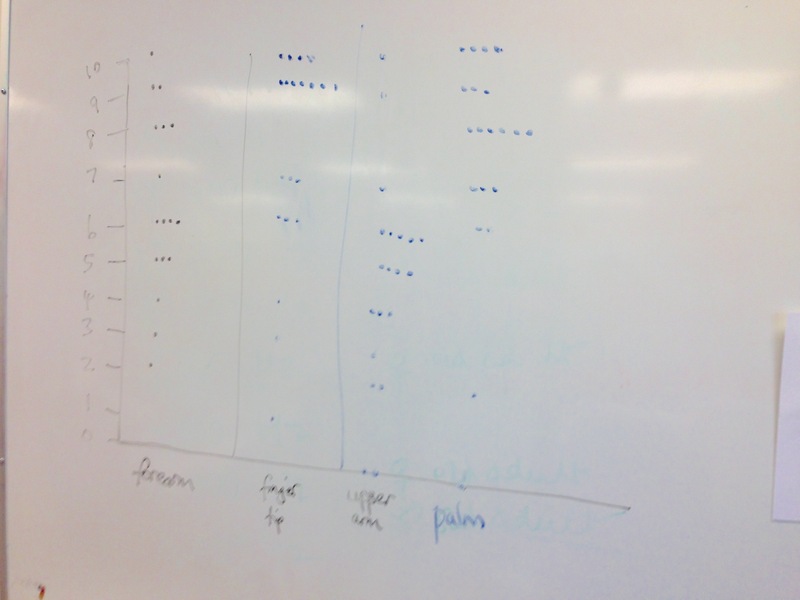 Ask students to tally the total “correct” for each body part, then as a class, graph the class results. Explain what the students have mapped and why. Where touch receptors are more closely spaced than the 1cm paperclip, you can sense each point independently and determine if it is one or two points. Where the receptors are more sparse, sometimes the two point touch will only stimulate one touch receptor, so it will feel like one point, and be incorrectly reported. 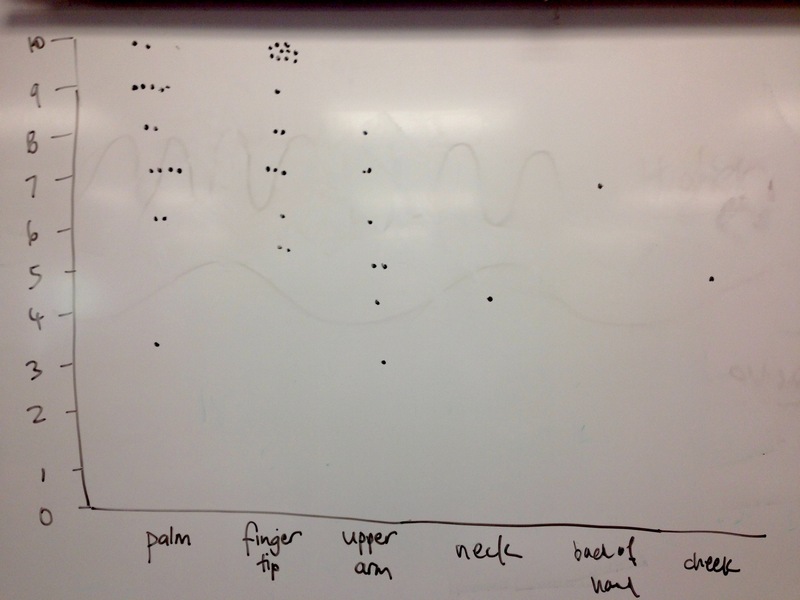 So from the number of correct responses we can predict the relative density of touch receptors for various body parts. Hence, the parts of the body that reported the correct number of touches more of the time would be predicted to have touch receptors closer together, and those that reported incorrectly more of the time would be predicted to have touch receptors further apart. Look at the students results and make these predictions. They are likely to conclude that fingertips and palms have more touch receptors, whereas the forearm and upper arm have fewer (though the forearm was a practice run so may have some errors and variation). Share with students the "threshold distances" (distances between touch receptors) for different parts of the skin, and discuss how they correlate with the students' results: Index Finger 2-3mm, Cheek 6mm, Nose 7 mm, Palm 10mm, Forehead 15mm, Shoulder 37mm, Forearm 40mm, Upper arm 45mm, Thigh 45mm, Calf 47mm (from http://www.ucalgary.ca/pip369/mod7/touch/neural1). Body parts with shorter threshold distances should have been better at detecting one vs two points. Instead of calling responses "correct", "accurate" is used as younger students are often worried about being right, so best to avoid judgement terms.